Marc shares some of the events that happened on this day in history, including the births of Susan Sontag and Joe Flacco, and the death of gospel singer Clara Ward. 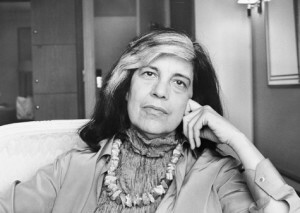 That was writer Susan Sontag. Today is her birthday. She was born in 1933, and was one of America’s giants of creativity, a writer of fiction, non-fiction, and essays, and a filmmaker. Susan Sontag strode into the midst of battle as she did in Sarajevo during the Bosnian War to produce the play Waiting for Godot there. In candlelight, she stood against the War in Vietnam, and in 1967 she wrote these words for which she was roundly condemned: “If America is the culmination of Western white civilization, as everyone from the Left to the Right declares, then there must be something terribly wrong with Western white civilization. This is a painful truth; few of us want to go that far. … The truth is that Mozart, Pascal, Boolean algebra, Shakespeare, parliamentary government, baroque churches, Newton, the emancipation of women, Kant, Marx, Balanchine ballets, et al., don’t redeem what this particular civilization has wrought upon the world. The white race is the cancer of human history; it is the white race and it alone—its ideologies and inventions—which eradicates autonomous civilizations wherever it spreads, which has upset the ecological balance of the planet, which now threatens the very existence of life itself” Happy birthday Susan Sontag. In the summer of 1863, draft riots raged through the streets of New York City. White working class men were tired of dying, while the wealthy bought their way out of the Civil War. Deeper than that during the riots was the divide between Black and White workers. To many of the white workers, the Emancipation Proclamation meant that free Blacks would come for their jobs and the war became about slavery. Abolitionists were the rioters’ targets. One of those abolitionists was Abigail Hopper Gibbons, who passed away today in 1893. During those riots 20 years earlier, they attacked Abigail Hopper Gibbons’ home in what is now Greenwich Village, and her story became known by many. As neighbors helped her to escape, she led the way as they ran across rooftops — some in flames — to escape the wrath of the racist mob. So we remember the brave Abigail Hopper Gibbons on this day, who was one of the White Abolitionists whose home was a stop on the Underground Railroad. She stood for equality for Black Americans when to do so meant risking your life. General William Tecumseh Sherman is famous or infamous depending on who you are in America. He led the March to the Sea, which crushed the Confederacy. Today in 1865, he issued Special Field Order No. 15, which redistributed 400,000 acres of land from Charleston, South Carolina to St. Johns River in Florida, to newly freed African slaves in 40-acre segments. The order broke up plantations and forbade White people from living on the land. Free Black folks formed militias and took over the land. But the wailing of slavers and their allies, and the politics of racism that did not want the empowerment of new freed people led to the order being overturned in the Fall of 1865 by President Andrew Johnson, who returned all of the land to the previous white owners. And in 1756, Virginia enacted the Statute for Religious Freedom, which was authored by Thomas Jefferson. Virginia became the first state to abolish its state religion, declaring that government-mandated religion was a violation of natural rights, and that no one should be compelled to profess any belief. It became the basis for First Amendment of the US Constitution guaranteeing Freedom of Religion. And we say happy birthday to our hometown, Super Bowl-winning quarterback, Joe Flacco. The football player and Baltimore Ravens quarterback was born today in 1985. Here’s a great song and for us to think about on this January the 16th. It’s by a great gospel alto who we lost on this day in 1973. Born in Philadelphia, this singer is remembered as one of the greatest soloists in gospel history. She brought gospel music to the mainstream and gave it a commercial appeal that had not been seen before. Their flamboyant style of performance upset some gospel traditionalists. I’m talking about Clara Ward and The Ward Singers. Here’s their performance of “Swing Low Chariot” We remember you, Clara Ward.